On August 20, 2015, the Sacramento Municipal Utility District (SMUD) held a Board meeting presided over by President Rob Kerth. Others have already pointed out how President Kerth attempted to stifle any discussion of smart meter public safety issues at the August 20th SMUD Board meeting. What I would like to highlight is his statement made at the end of the SMUD Board meeting. “I would like to take a moment then to remind everyone that worries about smart meters are both unfounded and completely unnecessary. Any efforts or investments made to avoid smart meters are entirely wasted. I know that change can be unnerving, especially when it comes quickly, but giving into hysteria and falling victim to the alarmists and the charlatans of our era will not improve anyone’s lives. Not only does President Kerth make a declaration that worries and concerns over smart meters are completely unfounded, he further demeans those who express concerns over smart meters as alarmists and charlatans. I submit to you that President Kerth is demonstrating himself as a ‘charlatan’ by making completely unsubstantiated, biased, and false statements that there are no issues regarding smart meters and for also demeaning and marginalizing consumers expressing legitimate concerns over smart meter technology, which are fully described and cataloged at this website. The consumers are actually the victims of this charlatan and of others like him. 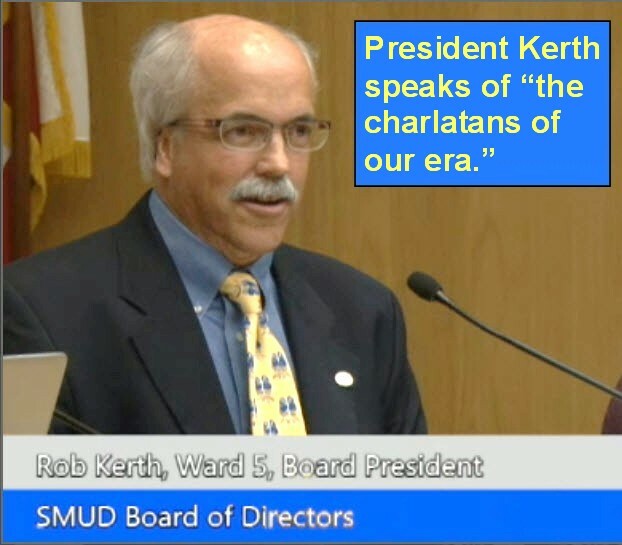 SMUD Board President Kerth is a prime example of the type of person who should not hold elected office. I encourage all citizens and consumers to be vigilant for these types of ‘charlatans’ and to vote them out of office at the earliest opportunity. This entry was posted in Smart Grid, Smart Meters, and RF Emissions and tagged Smart Meters. Bookmark the permalink. The remarks by the SMUD Board President are so ‘off-the-wall’ and absurd that I have followed-up with an analogy based upon a quote from a popular science fiction series to help demonstrate this. I have recommended in writing and verbally at subsequent meetings that Rob Kerth should schedule an appointment with the CEO and GM Arlen Orchard (former General Counsel) and with General Counsel Laura Lewis so that they can instruct him in the Ralph M. Brown Act. He really should. All of them should. Also, the other 6 Directors should hold him responsible for complying with the Brown Act. I told him at the meeting yesterday that he should not interrupt speakers during their public comments because it is bad form. Among their other deceptions and false statements, we found out at that meeting that although SMUD Strategic Director 6, Safety, requires them to track and report injuries caused by SMUD operations and facilities, and although at least two dozen SMUD customers have hand delivered and read to the Directors at meetings their sworn declarations of their health history vis a vis the smart meter, SMUD has never tracked or reported those as injuries. Why not? Because the CEO and GM’s interpretation of SD 6 is that he won’t count it unless they file a formal claim with SMUD using the SMUD claim form. This is arbitrary and not part of the written policy. SMUD did not inform ANY of those 2 dozen plus people that they have the right to file a claim, nor did SMUD give them a claim form or tell them where to find it. More deception by SMUD. When these CRETINS DIE, I hope they go straight to Hell. Yes for sure. I will add Pres Kerth to my nightly “empathy” prayer. Currently I target individuals from FPL and the FPSC, but I will include him. I agree, Very apt indeed. It may take more than prayers or a teachable moment in this instance for him to have a change in perspective. But I suppose it never hurts to try the power of prayer. I have become aware that on September 17, 2015, President Kerth, in an almost surreal manner, repeated his statement from August 20th, adding some additional language, such as the following. It is time for “those concerned citizens” to start looking after their health, and if suffering from the r/f radiated from the smart meter, take preventative action on their own until the smart meter program is halted. It will take time. Here is an expedient solution which wiil reduce over 95% r/f radiation to and from the smart meter. It works, I know from experience.I make therm! If I can, so can you! A faraday cage made to fit over the smart meter and anchored to the meter base with a couple of magnets, and the cage connected to ground via a wire. After installation, identify the structure with a tag similar writing to this: Property of ——————— address—————- remove for inspection and replace afterwards. Thank you. I make these cages out of aluminum screening with pipe strapping around the base of it. I use cabinet type magnets attached to the pipe strapping about 90 degrees opposite each other. It will not reduce dirty electricity, nor will it stop recording your power usage. live in apartment. how to get them removed? Looks like the ‘charlatan’ is Mr. Kerth, who exhibits a stunning level of blissful ignorance of the global radiation problem. Arrogant and uninformed people like him have no business holding such office. The Board of Directors: Renee.Taylor@smud.org, Nancy.Bui@smud.org, gbfishman@gmail.com, GenevieveShiroma@gmail.com, rob@kerth.us, davetamayo2@gmail.com, Bill.Slaton@smud.org. Yes the Board of Directors is aware of that. On July 16, 2015 I attended their meeting and gave a copy for each Director of a 35 page packet of information I had assembled consisting of scientific information on research on wireless radiation health effects, (the California Medical Association’s resolution on wireless standards re-evaluation from December 7, 2014, the EMF Scientist International Appeal dated May 11, 2015) SMUD’s July 8 response denying my claim for damages (the smart meter opt out fees, which I argued were not authorized because the overall smart grid / smart meter program was not authorized), SMUD’s concealment from customers of its opt out policy, etc. My packed included excerpts from this Santa Cruz letter and a link to it. Several times I have held up that packet at meetings, reminded them of it, asked them to read it, and even asked them to say how many pages of it they have read (half, a third, all?). None of them responded. Yesterday at the meeting Director Renee Taylor said that she does read the information that my colleagues and I send her. However she may be the only Director who does, and besides the information I send her is not reflected in the District’s policies. The conduct of Kerth is atrocious and the performance of the rest of them is contrary to the public interest, common sense, common decency and laws against fraud and deception. But we aren’t prosecutors and no prosecutor is likely to prosecute them for the above. This weak excuse for a man this President Kerth at the Sacramento meeting, is I allege very likely being paid what could be ascribed as Hush Money to try and bamboozle the Electricity Customers, but he will lose in the end as all wicked men and women do, but not before he has wrecked more peoples lives. He should be voted out of office as soon as possible as he seems to me to be a Lick-Spittle to this now proving to be to these Corrupt and Rapaciously Greedy Electricity Power Companies who don’t give a Tinkers Cuss how sick these Electric Microwave A.M.I broadcasting and receiving machines make the people. Mr Kerth seems to me to speak with a forked tongue. First he insults the listeners in the audience who want to bring light to the forced and wicked so-called Smart Meters. Then when people in the audience use polite but effective measures to allow him to let them speak he strays from his original view-point he tried to hammer home like the bully he is. Then at the end of the meeting he calls these people in the Audience who were given only three minutes each to put their case. He insults them with rude statements saying that they are in effect imagining these Microwave Illnesses and are Charlatans. This was cruel and disgusting of him. He shows no sympathy for these unfortunate victims and he is both a Disgrace to his office and to the Human Race and should be sacked immediately.